On 21 April 2009, the Commission adopted a report on the application of Council Regulation (EC) No 44/2001 of 22 December 2000 on jurisdiction and the recognition and enforcement of judgments in civil and commercial matters ( 3 ). The report concluded that, in general, the operation of that Regulation is satisfactory, but that it is desirable to improve the application of certain of its provisions, to further facilitate the free circulation of judgments and to further enhance access to justice. Since a number of amendments are to be made to that Regulation it should, in the interests of clarity, be recast. At its meeting in Brussels on 10 and 11 December 2009, the European Council adopted a new multiannual programme entitled ‘The Stockholm Programme – an open and secure Europe serving and protecting citizens’ ( 4 ). In the Stockholm Programme the European Council considered that the process of abolishing all intermediate measures (the exequatur) should be continued during the period covered by that Programme. At the same time the abolition of the exequatur should also be accompanied by a series of safeguards. On 27 September 1968, the then Member States of the European Communities, acting under Article 220, fourth indent, of the Treaty establishing the European Economic Community, concluded the Brussels Convention on Jurisdiction and the Enforcement of Judgments in Civil and Commercial Matters, subsequently amended by conventions on the accession to that Convention of new Member States ( 5 ) (‘the 1968 Brussels Convention’). On 16 September 1988, the then Member States of the European Communities and certain EFTA States concluded the Lugano Convention on Jurisdiction and the Enforcement of Judgments in Civil and Commercial Matters ( 6 ) (‘the 1988 Lugano Convention’), which is a parallel convention to the 1968 Brussels Convention. The 1988 Lugano Convention became applicable to Poland on 1 February 2000. On 22 December 2000, the Council adopted Regulation (EC) No 44/2001, which replaces the 1968 Brussels Convention with regard to the territories of the Member States covered by the TFEU, as between the Member States except Denmark. By Council Decision 2006/325/EC ( 7 ), the Community concluded an agreement with Denmark ensuring the application of the provisions of Regulation (EC) No 44/2001 in Denmark. The 1988 Lugano Convention was revised by the Convention on Jurisdiction and the Recognition and Enforcement of Judgments in Civil and Commercial Matters ( 8 ), signed at Lugano on 30 October 2007 by the Community, Denmark, Iceland, Norway and Switzerland (‘the 2007 Lugano Convention’). The scope of this Regulation should cover all the main civil and commercial matters apart from certain well-defined matters, in particular maintenance obligations, which should be excluded from the scope of this Regulation following the adoption of Council Regulation (EC) No 4/2009 of 18 December 2008 on jurisdiction, applicable law, recognition and enforcement of decisions and cooperation in matters relating to maintenance obligations ( 9 ). The owner of a cultural object as defined in Article 1(1) of Council Directive 93/7/EEC of 15 March 1993 on the return of cultural objects unlawfully removed from the territory of a Member State ( 10 ) should be able under this Regulation to initiate proceedings as regards a civil claim for the recovery, based on ownership, of such a cultural object in the courts for the place where the cultural object is situated at the time the court is seised. Such proceedings should be without prejudice to proceedings initiated under Directive 93/7/EEC. The notion of provisional, including protective, measures should include, for example, protective orders aimed at obtaining information or preserving evidence as referred to in Articles 6 and 7 of Directive 2004/48/EC of the European Parliament and of the Council of 29 April 2004 on the enforcement of intellectual property rights ( 11 ). It should not include measures which are not of a protective nature, such as measures ordering the hearing of a witness. This should be without prejudice to the application of Council Regulation (EC) No 1206/2001 of 28 May 2001 on cooperation between the courts of the Member States in the taking of evidence in civil or commercial matters ( 12 ). (f) wills and succession, including maintenance obligations arising by reason of death. (a) ‘judgment’ means any judgment given by a court or tribunal of a Member State, whatever the judgment may be called, including a decree, order, decision or writ of execution, as well as a decision on the determination of costs or expenses by an officer of the court. (f) ‘court of origin’ means the court which has given the judgment the recognition of which is invoked or the enforcement of which is sought. (b) in Sweden, in summary proceedings concerning orders to pay (betalningsföreläggande) and assistance (handräckning), the Enforcement Authority (Kronofogdemyndigheten). (4) in matters relating to a contract, if the action may be combined with an action against the same defendant in matters relating to rights in rem in immovable property, in the court of the Member State in which the property is situated. (c) if he is a co-insurer, in the courts of a Member State in which proceedings are brought against the leading insurer. (5) which relates to a contract of insurance in so far as it covers one or more of the risks set out in Article 16. (5) notwithstanding points 1 to 4, all ‘large risks’ as defined in Directive 2009/138/EC of the European Parliament and of the Council of 25 November 2009 on the taking-up and pursuit of the business of Insurance and Reinsurance (Solvency II) ( 14 ). 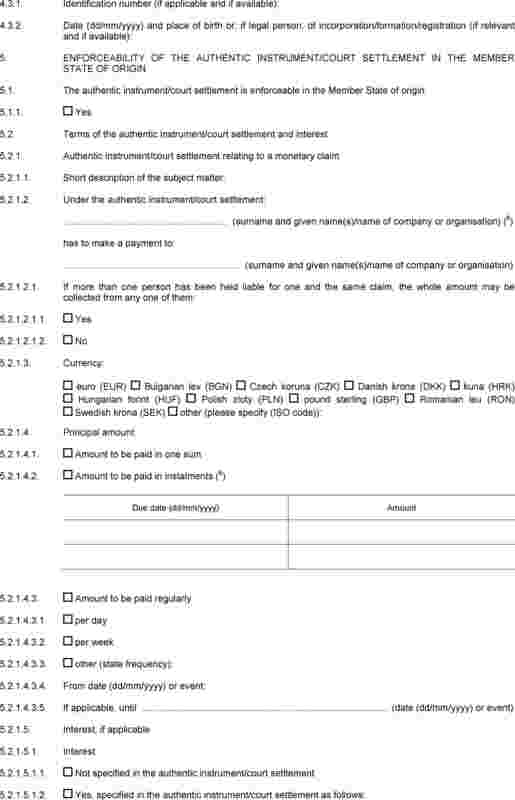 (3) which is entered into by the consumer and the other party to the contract, both of whom are at the time of conclusion of the contract domiciled or habitually resident in the same Member State, and which confers jurisdiction on the courts of that Member State, provided that such an agreement is not contrary to the law of that Member State. (ii) if the employee does not or did not habitually carry out his work in any one country, in the courts for the place where the business which engaged the employee is or was situated. 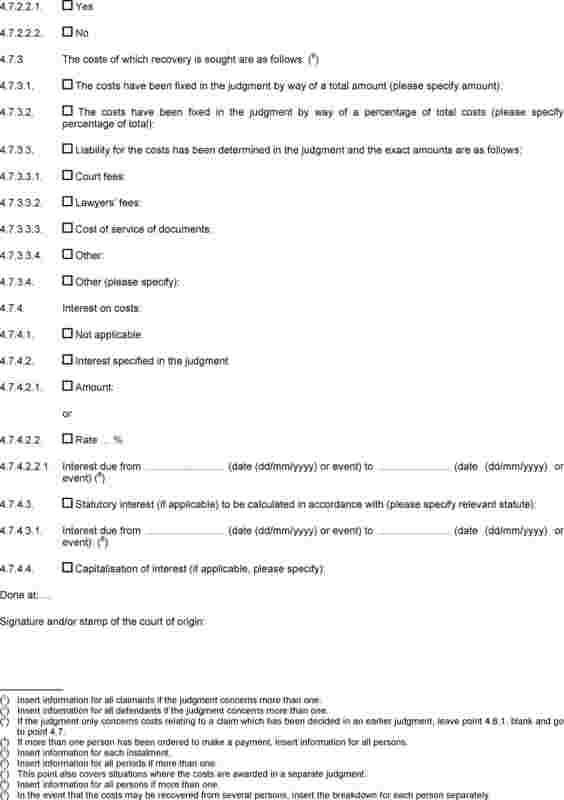 (2) which allows the employee to bring proceedings in courts other than those indicated in this Section. 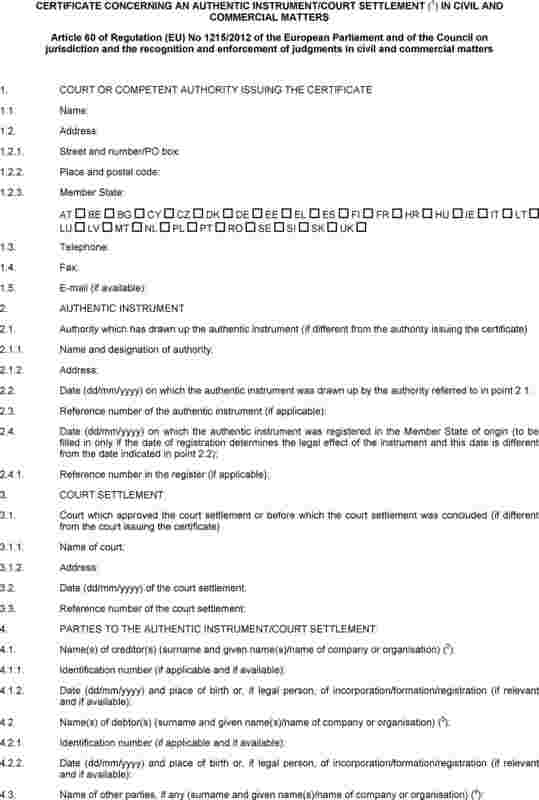 (4) in proceedings concerned with the registration or validity of patents, trade marks, designs, or other similar rights required to be deposited or registered, irrespective of whether the issue is raised by way of an action or as a defence, the courts of the Member State in which the deposit or registration has been applied for, has taken place or is under the terms of an instrument of the Union or an international convention deemed to have taken place. (5) in proceedings concerned with the enforcement of judgments, the courts of the Member State in which the judgment has been or is to be enforced. 3. Article 19 of Regulation (EC) No 1393/2007 of the European Parliament and of the Council of 13 November 2007 on the service in the Member States of judicial and extrajudicial documents in civil or commercial matters (service of documents) ( 15 ) shall apply instead of paragraph 2 of this Article if the document instituting the proceedings or an equivalent document had to be transmitted from one Member State to another pursuant to that Regulation. 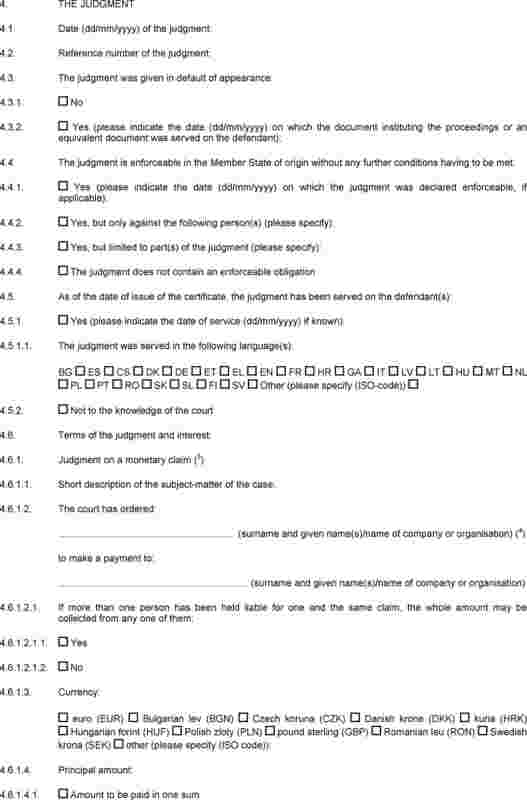 (b) if the document has to be served before being lodged with the court, at the time when it is received by the authority responsible for service, provided that the claimant has not subsequently failed to take the steps he was required to take to have the document lodged with the court. (b) the court of the Member State is satisfied that a stay is necessary for the proper administration of justice. (c) the continuation of the proceedings is required for the proper administration of justice. (c) the court of the Member State is satisfied that a stay is necessary for the proper administration of justice. (d) the continuation of the proceedings is required for the proper administration of justice. (b) the certificate issued pursuant to Article 53. (b) an application has been submitted for a decision that there are no grounds for refusal of recognition as referred to in Article 45 or for a decision that the recognition is to be refused on the basis of one of those grounds. 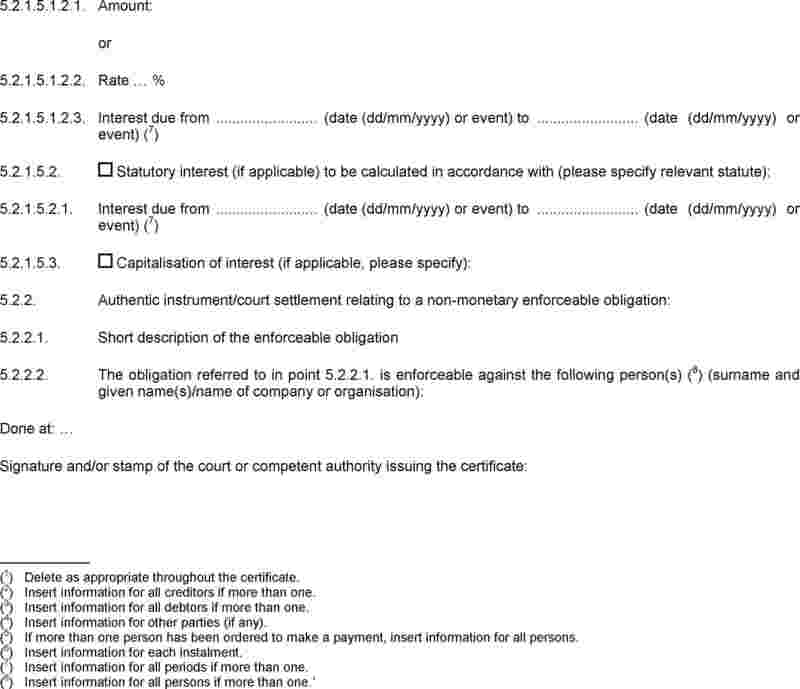 (b) the certificate issued pursuant to Article 53, certifying that the judgment is enforceable and containing an extract of the judgment as well as, where appropriate, relevant information on the recoverable costs of the proceedings and the calculation of interest. 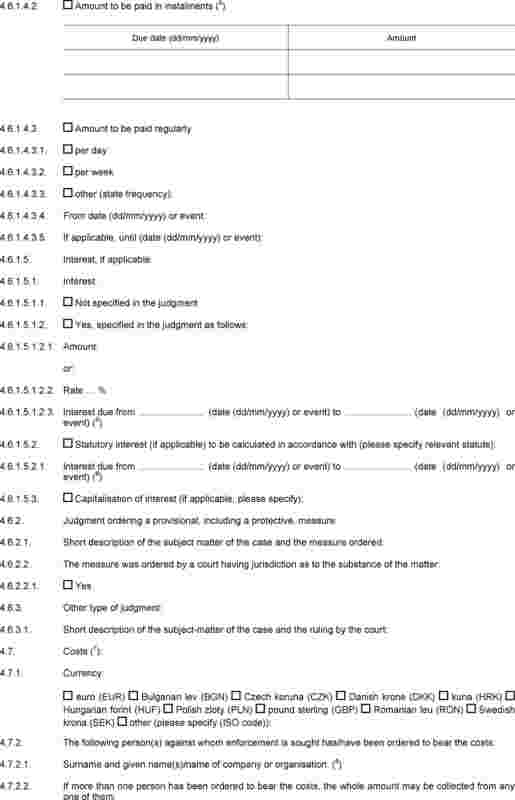 (c) where the measure was ordered without the defendant being summoned to appear, proof of service of the judgment. (b) the official language of the Member State in which he is domiciled or, where there are several official languages in that Member State, the official language or one of the official languages of the place where he is domiciled. (c) suspend, either wholly or in part, the enforcement proceedings. (ii) Section 6 of Chapter II. (c) principal place of business. 3. The Member States included in the list referred to in paragraph 1 shall, within the framework of the European Judicial Network in civil and commercial matters established by Council Decision 2001/470/EC ( 16 ) (‘the European Judicial Network’) provide information on how to determine, in accordance with their national law, the effects of the judgments referred to in the second sentence of paragraph 2. 1. For the purposes of this Regulation, a court common to several Member States as specified in paragraph 2 (a ‘common court’) shall be deemed to be a court of a Member State when, pursuant to the instrument establishing it, such a common court exercises jurisdiction in matters falling within the scope of this Regulation. (b) the Benelux Court of Justice established by the Treaty of 31 March 1965 concerning the establishment and statute of a Benelux Court of Justice (the ‘Benelux Court of Justice Treaty’). (2) where the defendant is not domiciled in a Member State, and this Regulation does not otherwise confer jurisdiction over him, Chapter II shall apply as appropriate regardless of the defendant’s domicile. (3) where a common court has jurisdiction over a defendant under point 2 in a dispute relating to an infringement of a European patent giving rise to damage within the Union, that court may also exercise jurisdiction in relation to damage arising outside the Union from such an infringement. 1. Articles 29 to 32 shall apply where proceedings are brought in a common court and in a court of a Member State not party to the instrument establishing the common court. 2. Articles 29 to 32 shall apply where, during the transitional period referred to in Article 83 of the UPC Agreement, proceedings are brought in the Unified Patent Court and in a court of a Member State party to the UPC Agreement. (b) judgments given by the courts of a Member State not party to the instrument establishing the common court which are to be recognised and enforced in a Member State party to that instrument. However, where recognition and enforcement of a judgment given by a common court is sought in a Member State party to the instrument establishing the common court, any rules of that instrument on recognition and enforcement shall apply instead of the rules of this Regulation. 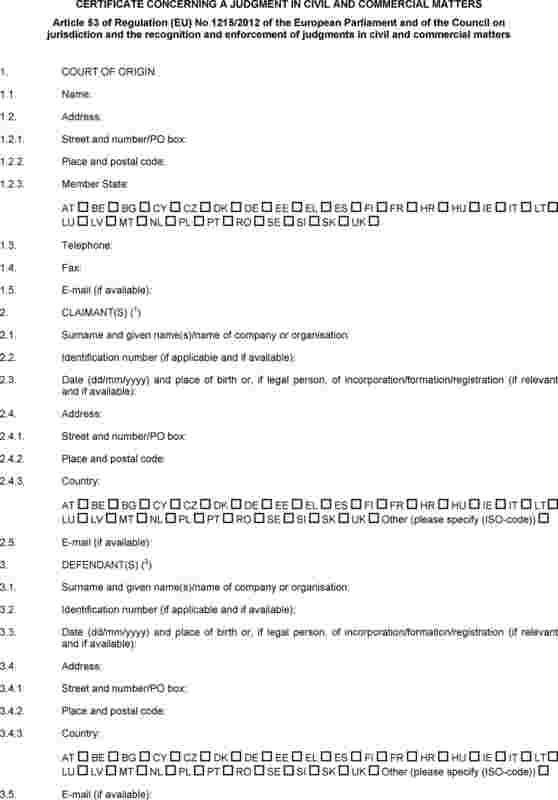 (d) the languages accepted for translations of the forms as referred to in Article 57(2). (c) the conventions referred to in Article 69. ( 1 ) OJ C 218, 23.7.2011, p. 78. ( 2 ) Position of the European Parliament of 20 November 2012 (not yet published in the Official Journal) and decision of the Council of 6 December 2012. ( 3 ) OJ L 12, 16.1.2001, p. 1. ( 4 ) OJ C 115, 4.5.2010, p. 1. ( 5 ) OJ L 299, 31.12.1972, p. 32, OJ L 304, 30.10.1978, p. 1, OJ L 388, 31.12.1982, p. 1, OJ L 285, 3.10.1989, p. 1, OJ C 15, 15.1.1997, p. 1. For a consolidated text, see OJ C 27, 26.1.1998, p. 1. ( 6 ) OJ L 319, 25.11.1988, p. 9. ( 7 ) OJ L 120, 5.5.2006, p. 22. ( 8 ) OJ L 147, 10.6.2009, p. 5. ( 9 ) OJ L 7, 10.1.2009, p. 1. ( 10 ) OJ L 74, 27.3.1993, p. 74. ( 11 ) OJ L 157, 30.4.2004, p. 45. ( 12 ) OJ L 174, 27.6.2001, p. 1. ( 13 ) OJ L 299, 16.11.2005, p. 62. ( 14 ) OJ L 335, 17.12.2009, p. 1. ( 15 ) OJ L 324, 10.12.2007, p. 79. ( 16 ) OJ L 174, 27.6.2001, p. 25.